J&J Richardson Electrical Ltd is an approved qualified Electrician West Ealing. We are NICEIC Domestic Installers & Approved Contractors. We cover West Ealing and the surrounding areas. 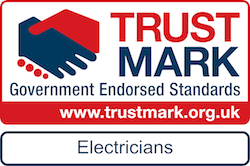 Approved NICEIC Qualified & Trustmark Endorsed Electrician West Ealing. J&J Richardson Electrical Ltd deliver a wide range of electrical services, that provide technical advice and recommendations that assure you that all electrical work carried out meets legal requirements and is above all, safe. J&J Richardson Electrical are your Electrician in West Ealing.